More than a century ago, Bordet and Gengou identified a heat-sensitive substance in the blood that was required for the lysis of antibody-coated bacteria and erythrocytes. They named the substance ’complement’. 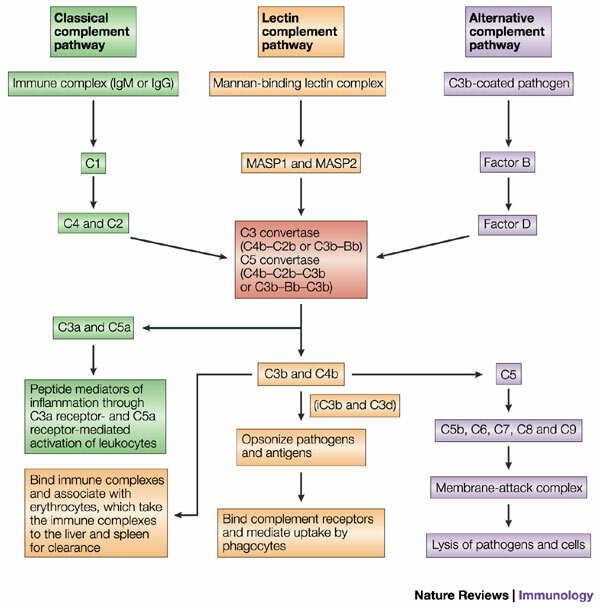 It is now clear that the complement system is a large family of 20 or more serum proteins and cell-surface receptors that are crucial for both innate and adaptive immunity. 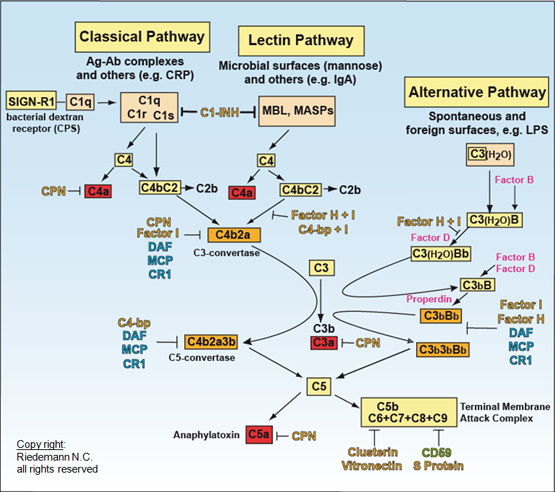 The complement system is activated by three different pathways: the classical, lectin and alternative complement pathways. The classical pathway is initiated by activation of the complement component 1 (C1) complex by IgM- or IgG-containing immune complexes. Activated C1 cleaves C4 and C2 to generate C4b–C2b (also known as the classical C3 convertase), which converts C3 to C3a and C3b. The complement proteins C4 and C3 both have an internal thioester bond that becomes exposed after activation and forms spontaneous covalent ester or amide links with antigens56, 57, 58, 59. Activated C3 (C3b) combines with C4b–C2b to form C4b–C2b–C3b (also known as the classical C5 convertase), which converts C5 to C5a and C5b. Alternatively, C3b can interact with factor B to form C3b–Bb (also known as the alternative C3 convertase) and C3b–Bb–C3b (also known as the alternative C5 convertase). The alternative complement pathway can also be activated spontaneously when C3 binds covalently to acceptor sites and interacts with factor B to form an active C3 convertase. The lectin complement pathway is activated when collectins, such as mannan-binding lectin (MBL) or ficolins, bind their ligands (mannan or N-acetylglucosamine, respectively), which are expressed by microbial pathogens. Both ficolins and MBL — which is structurally similar to C1q — are associated with MBL serine proteases (MASPs), which cleave C4 and C2 to form a C3 convertase52, 60. iC3b, inactivated C3b. Riedemann NC, Ward PA: Complement in ischemia reperfusion injury. Am J Pathol 162:363, 2003. Weiser MR, et al: Reperfusion injury of ischemic skeletal muscle is mediated by natural antibody and complement. J Exp Med 183:2343, 1996.